Berlin: City of Smoke, Jason Lutes. Drawn and Quarterly. 200 pp. $19.95. With the release of Berlin: City of Smoke, the second volume of a projected trilogy, Jason Lutes’ painstakingly chronicled historical fiction in graphic form gathers momentum. Tracing the long, slow arc of the fall of the Weimar Republic, Berlin packs the power of a relentless juggernaut, steady and unyielding, while unraveling the smallest details of the intertwined lives of its characters. Already over ten years in the making, Berlin is finally two-thirds of the way finished, with the first collection, City of Stones, having been released in 2000. City of Smoke, which spans the period from June 1929 to September 1930, picks up where City of Stones left off—just after the disastrous May Day parade of 1929, in which over 20 marchers were killed by the police. Opening with a new introduction—featuring a quintet of jazz musicians from America known as the Cocoa Kids—the storyline soon expands to reacquaint the reader with a bevy of Berlin regulars: artistically inclined ingénue Marthe Müller, rapidly growing accustomed to all the possibilities living in Berlin has to offer; her lover, the despairing optimist Kurt Severing, a writer for left-wing publication Die Weltbühne; Anna, her best friend and eventual paramour; Silvia, the teenage daughter of murdered Communist Gudrun Braun, now reduced to fending for herself on the mean streets of a city in turmoil; and Pavel the Jewish scavenger, who takes her under his ragged wings. In addition to exploring the cultural milieu—from jazz music to the lesbian cabaret—Lutes continues to chronicle the political tensions of the time, from the untimely deaths of statesman Gustav Stresemann and Nazi poster boy Horst Wessel to the ill-fated chancellorship of Heinrich Brüning. The dichotomy between the two worlds—the playful and the political—is exacerbated by the decline that permeates both, a condition each one’s inhabitants are quick to blame on the other’s. In Lutes’ carefully crafted vision of the Prussian capital, the cultural indicators of the time are mainly distilled through the filters of three characters: Marthe Müller, Kurt Severing, and Silvia Braun. Marthe, an enigmatic sketch-artist from Köln, is the window through which much of Berlin’s ecstatic underbelly is revealed. Quickly morphing from awkward wallflower to social butterfly, and reveling in the hedonism of a populace propelling itself nightly into a Neronian frenzy, Marthe embodies an unapologetically modern direction, diverging willfully from outdated modes of behavior. This independence is not without its fallout, of course. Her love of jazz music and frolic displease her lover Kurt, and eventually she descends too far into the realm of frivolity for him to follow. She further severs her ties to her family back in Köln, and eventually even from her decadent mentor Margarethe von Falkensee (whom I assume is based on the author of Blue Angel Confessions, though this facet of her character has not yet been remarked upon). Through Marthe, the reader experiences a flourishing empire of the senses. From smoky jazz clubs to the outrageous cocaine orgies of aristocrats and their anonymous “escorts,” Berlin is exposed as a city of infinite possibility. When Marthe winds up romantically involved with her suit-wearing, cigar-smoking art school friend Anna, it feels more like a recommitment to self-discovery than the product of a lifelong predilection. But she is no mere dilettante—from her past she harbors the tragedy of the death of her younger brother, and her natural talent for draftsmanship also separates her somewhat from the more superficial socialite set. The realm of political theory is mainly personified by leftist journalist Kurt Severing. A pacifist in violent times, Kurt reveals his personal qualities to be existential ones. Prone to black moods, seclusion, and a workaholic’s dread of time wasted, he nonetheless falls for Marthe, until it becomes evident that her unbearable lightness cannot sustain him. Like many middle-aged intellectuals, he prefers his fortress of solitude to the inelegant diversions of the day, yet his painful devotion to the human condition won’t allow him to sequester himself completely while violence reigns in the streets and democratic freedoms are publicly eroded. Within Kurt’s sphere we become privy to much of the Weimar Republic’s charged political atmosphere. His editor is accused of treason (this storyline is based on historical fact), one of his friends is in hiding, and his girlfriend becomes entangled with another woman while he testifies in Leipzig. He confronts ex-lover Margarethe over a personal matter while contemplating the death of Gustav Stresemann, and he is later found in his neighborhood bar sarcastically drinking the health of Chancellor Heinrich Brüning—whose appointment circumvented the power of Parliament and foreshadowed the dictatorial policies of the Third Reich. His despairing awareness of the direction in which his heimatland heads provides an uncomfortable counterpoint to Marthe’s excited identity-explorations as Kurt struggles against the encroaching tide of fascism, armed only with his typewriter and his thus far misplaced faith in the inherent ability of his fellow Germans to rise above apathetic acceptance of the nation’s downward spiral. A third thread of Berlin follows the trail of Silvia Braun, whose tribulations underscore the economic realities of a penurious population far removed from the socialite circles. The daughter of a Communist and a National Socialist, by birthright alone she embodies the struggle between the far left and far right. Herself a Communist sympathizer, she avoids her father’s home, where he is raising her two younger siblings to be NSDAP supporters. Slowly starving in a city beleaguered by chronic food shortages, the homeless teenager eventually falls under the benign protection of a fellow tramp, Pavel, who brings her on his scavenging rounds and keeps her fed. Angered by the effects of King Wilhelm’s lost war and abdication on the working class, Silvia’s view of political justice is quite jaded, made understandably more so by the death of her mother on Blutmai, the infamous 1929 Mayday massacre. Still, she agitates to become a foot soldier in the same Communist organization with whom her mother lost her life, and represents the politics of radical action against the endless compromise and hypothesizing of the proponents of due process. 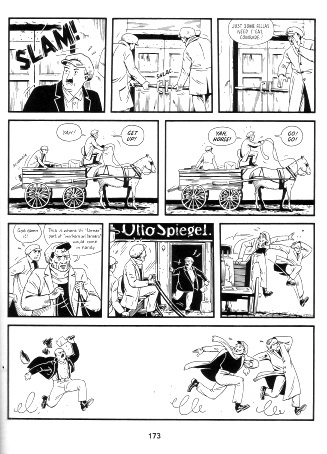 Although Lutes is an American, Berlin has a distinctly European flavor, aided in no small part by his use of the ligne Claire drawing style, first popularized by Hergé in Tintin. 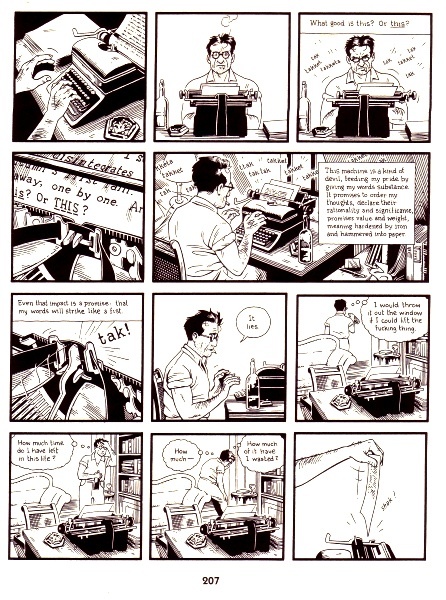 Referred to by Scott McCloud as a “democracy of form,” the clear lines resist most shading and cinematic perspective. No single figure is given more attention than another, from the detail of wallpaper to the glance of a guttersnipe. Lines drawn with meticulous evenness form the bulwark of Lutes’ approach, interspersed with clever Hergé-like flourishes: the drops of sweat flying cartoonishly from a worried countenance, floating punctuation points revealing befuddlement, and jagged zig-zag lines emanating from the eyeballs to denote an angry glare. In something of a break from the traditional format of ligne Claire, where painstaking background detail pervades almost every panel, Lutes often does pay sole attention to the figures of his characters, such as when Kurt confronts Margarethe in her Wintergarten and only their bodies, seated across a simple table, remain on tense, egalitarian display. But for the scene’s introduction and denouement Margarethe’s lushly styled parlor is elided, a suggestion of time and place anchoring their otherwise universal exchange to a specific age. And finally, unlike more action-oriented comics, Berlin relies heavily on text to set the mood and tone of each storyboard, especially the lengthy internal monologues of both Kurt (clinical and erudite) and Marthe (endlessly fascinated), which can run on for pages of uninterrupted extemporization. Though Berlin is ostensibly set during an era doomed to be a historical footnote, it exhibits relevance as a fully timely exploration of enduring themes: discovery, loss, honor, and resilience. Not merely a portrait of pending collapse but a testament to the durability of the human spirit, City of Smoke disturbs the equilibrium while championing its continued evolution. In this context, we can rely upon Kurt Severing to sum up the abiding sentiment: “I desperately want to believe . . . that these systems can work. That human beings can put their faith in each other, (and) that base instinct can be conquered . . .” Whether or not his hopes will ever see fruition has yet to be determined. Nicole Gluckstern is a writer living in San Francisco. She is a frequent contributor to the San Francisco Bay Guardian and a contributing editor of Other magazine.